The Honourable (retired) Justice David W. Gruchy passed away in Halifax on May 22, 2016. He was 84 years of age. Justice Gruchy was appointed to the Nova Scotia Supreme Court (Trial Division) on July 6, 1990. He remained at that Court until his retirement in March of 2007. In total, his legal career spanned an impressive 49 years - 32 years as a lawyer and 17 on the Bench. Born in Bishop's Falls, Nfld., Justice Gruchy attended the University of Kings College in Halifax and later earned his Law Degree at Dalhousie University. He was admitted to the Nova Scotia Bar in 1958 after articling with R. Lorne MacDougall, Q.C. 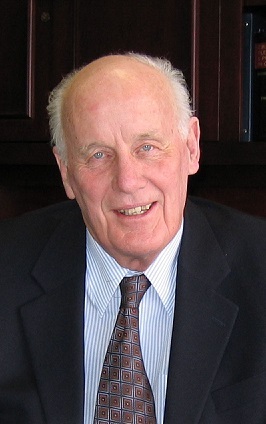 Before his appointment to the Bench, from 1958 to 1990, Justice Gruchy conducted a general practice in Truro, N.S., as part of the firm of Burchell, MacDougall and Gruchy, specializing in labour, municipal and administrative law and civil litigation. He was the town solicitor for Truro from 1975 to 1990 and the founding member of the Truro Industrial Commission. He received his designation as Queen's Counsel in 1974. Justice Gruchy was President of the Canadian Transportation Lawyers’ Association and Vice-Chair of the Law Foundation of Nova Scotia. He sat on the Nova Scotia Bar Council, as well as various committees of the Canadian Bar Association. Following his retirement from the Bench in 2007, Justice Gruchy served on the Nova Scotia Criminal Review Board, the Nova Scotia Securities Commission and as Chair of the Nova Scotia MLA Pension Review Committee in 2011. Justice Gruchy is survived by his wife of 60 years, Betty, his four children, Phil, Steve, Rick and Sally, and numerous grandchildren. Read the entire obituary here >>.